First, I must declare my bias. I am an adoring fan of Katherine Mansfield. I live “At the Bay”, and I covet every word she ever wrote, from the fledgling “In a German Pension” to the final triumphs when New Zealand takes centre stage, and where her loss (her brother), her craft (hard won), combine to enliven the page, and enlighten our hearts. 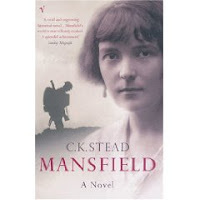 My Classics Book Group recently read “Mansfield” by C.K. Stead. I had read it once before, in 2004 when first published, and indeed I have a signed copy from the man himself which I queued to get. I loved it then, and I loved it again. I’ve read Joanna Woods’ Katerina which I can highly recommend, and I’ve read A Secret Life by Claire Tomalin, and as you’ve already most likely gathered, I think I’ve read most of KM’s short stories. And so, it is with extraordinary joy that I have twice read, C K Stead’s tribute to “our” girl. The thrill of this book is the idea that quickly insinuates itself, that you are hearing KM, that you are inside her head, and although you know you are not, it is hard to shake and it is rewarding. We will never know the real Katherine, only people’s versions of her and I recommend Stead’s masterful, and at the same time, deliciously simple achievement. In the Prologue, we have a delightful and revelatory encounter with T. S. Eliot and Katherine Mansfield on a London Street with a view of the Hammersmith Bridge. They’ve escaped from a social occasion, their conversation is littered with literary highlights, Captain (Robert) Graves whom Katherine dislikes, Vivienne (Eliot’s wife), Lady Ottoline… and immediately you feel like an insider, as if the author knows you know. The prose is tight, it is spare, and it concentrated. So much is revealed by so little. Throughout the compact novel, artists and writers appear almost casually and yet with the full impact intended. We have Katherine’s friendship with Beatrice Hastings who just happens to have ended an affair with an Italian painter (Modigliani) and started one with a Spaniard (Pablo Picasso). For those who know, what fun to be reminded, and for those, like me who had no idea, what a gem, so neatly inserted. This is what makes the book so satisfying. History reveals itself almost unobtrusively. Cleverly and looking as if it is ever so easy, Stead has used his knowledge and research to combine fact with his imagination. Sometimes (infrequently), the reader will recognise that the author is purposefully constructing history around a particular character, but it is so tight and so spare, that you don’t mind. Atmosphere is not the main thrust of the novel, but suddenly we are in a bookshop where Yeats has read with Fred Goodyear 1915, “There was a fireplace and a coal fire burning with even a cat stretched out in front of it. Around the room, hanging from shelves and draped over the table were Rhyme sheets, each containing a single poem…” Fred is meeting Jack at the bookshop and they are going together to meet D.H. Lawrence. Casual, and yet so much history and atmosphere crammed into the bookshop. Where the author really hits his straps for me is the chapter when D.H. Lawrence has invited Katherine and Jack to stay with him and Frieda in Cornwall. The build up to Katherine and Jack’s arrival, and then the bizarre culmination with D.H. Lawrence and Frieda, their physical fury with one another, the way in which it builds and is enacted, is extraordinary and the polite and confused detachment with which KM and Jack view this. I loved the conversation afterwards when Frieda and her Lorenzo (D. H. Lawrence) lie in bed and talk and agree that the Murrys won’t stay, that they will tell Ottoline that Lawrence has beat Frieda; the wonderful intimacy of the couple who have in public behaved appallingly but in private have a whole other understanding. But, finally, this is only “one” voice for Katherine and however insightful it is and however compelling the read, it is too, a very male perspective and this is not a criticism but an observation. I feel that Jack Murray is lent a sympathetic ear, and for me I feel enraged sometimes at how ineffectual he was, but then, what choice did the poor man have - he was but a bit player on the stage of the life of a woman ahead of her time. It seemed to my Classics Book Group, that perhaps she loved Jack when she wrote about it, or to him, but that living with him, was never quite enough. Perhaps it wasn’t his fault. In the end, the terrible, tragic end, the thing that haunts me most and which Stead tactfully avoids, is the horrible idea of Katherine dying alone with the doctors as Jack, left the room, avoiding the last and most important responsibility – to be there with her.